The script idea stems from the real life of Frank Harris. The cowboy initiation is a fine idea and Cowboy executes it well under the no-nonsense direction of Delmer Daves. You never get the feeling of excess in this production. It's to the point, it delivers the messages without massage, and gets on with it. Daves finds the right bits of business for his actors so that they look perfectly natural in their environment. Frank Harris is a Chicago hotel clerk ready for bigger and better things when cattle man Tom Reese storms into the hotel with his dusty team of cowboys. Harris is inspired to ask Reese for a chance to join his next cattle drive, but Reese isn't interested in giving cowpuncher lessons. But Harris' fate is in the cards and he winds up entering a tenuous partnership with the tough and truculent Reese. The romantic elements are logically subservient to the prime entertainment mission. There's plenty of down home charm in the Chicago scenes, from the bawdy entrance of Reese and company to Harris's interview in the bathroom. The humor is lots of fun and seems natural to the material. The trail sequences are consistently well-done and unadorned by excess. Two episodes that stand out are the very straight forward stampede sequence and the bull ring sequence is equally adept. There aren't any bad guys in Cowboy; maybe some short tempers and bad nerves, but no bad guys, and that's an enormous virtue of the material. Glenn Ford is an excellent trail boss Tom Reese. Part cowboy, part entrepreneur, Ford captures the toughness in the negotiating room and on the trail. 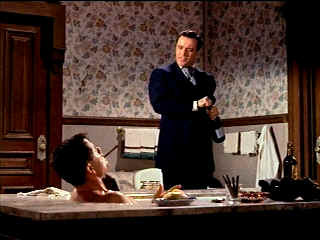 Jack Lemmon makes a very nice change in the role of Harris. It almost plays against Lemmon's natural screen persona, but he's convincing when the change comes about. It's especially nice since his change evokes a change in Reese. Heavy and inconsistent grain diminishes the beauty of Cowboy's image on DVD. Black levels and shadow detail are fine. Creases and lapels on dark garments are well defined. The transfer elements appear faded to some degree. Check out the tomatoes in the hotel buffet spread; far too pale for turn of the century tomatoes, much less Hollywood tomatoes. Element discoloration crops up from time to time, most prominently at scene transitions. The transfer is very sharp without any residual edginess. There are some specs of dirt but they do not intrude on the image. Flesh tones are somewhat pasty, but it likely related to the slight element fading. There are a couple of scenes that look like they might have been panned to encompass the entire scene, but Cowboy was almost definitely shot 1.33 open matte and likely composed for 1.85 theatrical display, so depending on how protected it was composed would determine any visual compromises at 1.33. The mono sound is clean and the music has a nice range. Place or time it's still a Western from John Ford's Drums Along the Mohawk to John Sturges' Bad Day at Black Rock. The Movie Poster Archive includes extensive poster images from the films of stars like Susan Hayward, Kirk Douglas, Katharine Hepburn and many more. Our featured star is Kirk Douglas. John Wayne invests Ethan Edwards with enormous dignity and determination. A classic western from director John Ford. Mesmerizingly beautiful. The major studio vaults are filled with incredible film treasures which few have seen the light of DVD. The home of Francis Ford Coppola's Zoetrope Studios has more corridors of interest than you might expect. The home of John Tisch's invaluable Poster Price Almanac. Every serious poster collector uses the Almanac as a reference.